Hopefully my Dad doesn’t see this (because he might think I’m making fun of him), but if he does, hopefully he knows that this is such a perfect encapsulation (is “encapsulation” a word?) of his spirit and part of why we all love him, I had to blog about it to make it a permanent memory. Back in March, he and his lady-friend (“lady-friend” is what seniors, a widow and widower in this case, call their girlfriends and boyfriends because, really, people in their 60s and 70s should have a better way to describe someone they’re dating and/or living with than “girlfriend” or “boyfriend”. And I’m glad they didn’t go with “she’s my crush”) went to Florida and my Dad is apt to check-in while traveling (ie “we’re safe in Atlanta” or “we’re hitting the road tomorrow at 6am with plans to drive straight through”). Dad likes when we kids (my brother, sister, myself and our spouses) “check-in”, and he gives us the same courtesy. There’s a whole back story, too. On the eve of their trip, there was some weather coming. “Snow down south.” And he and Sally had been watching the weather. When I talked with my Dad the day before to say “have a good trip” he told me they were getting on the road at 4:00 a.m. Well, as it turns out, and what this email doesn’t tell you is he and Sally barely slept that night (worried about the weather) and at 2:00 a.m., both not able to sleep, they hit the road. AND THANK GOODNESS THEY DID (a little sarcasm there) because the weather was as bad (or worse) than anticipated and the email I’ve cut & pasted below, along with my Dad’s monitoring of the trucker chatter on his CB radio, confirmed the early-early (too-early) start to the trip was the best thing they could’ve done (a little sarcasm there, too). Oh, yes. The CB radio is really the best part of this. For my entire life, my Dad travels with a CB radio and monitors the truckers because their chatter and conversations are better than any smartphone app, or map, or news and weather report on the radio. He knows where cops are and speed traps are. He knows where back-ups are (he and my mother have re-routed us off and onto highways many times in our travels based on hot-tips from truckers). Truckers can tell my Dad the exact weather at any exact moment and he loves when the truckers are talking about some reckless driver or somebody broken down on the side of the road and he can pick a new lane and avoid any slowdowns or trouble. And I’m not “making fun” of him. I love it. Right after my wife and I got married, he bought us a CB Radio and I never used it. But damn it, now, I wish I hadn’t sold it at a garage sale. I think I’d actually use it. For good and for nostalgia and entertainment purposes. Well, we got to Perry Georgia about 5:45 checked in and went to our favorite restaurant The Swanson. 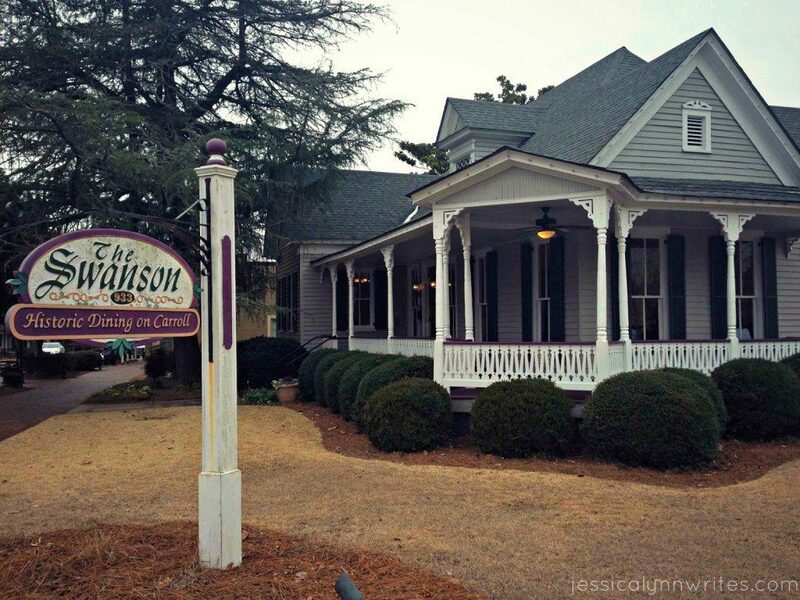 It’s a great little restaurant in a small old house and has some great southern cooking and hospitality. Not expensive and comfortable portions. We have yet to have anything we didn’t like. I had grilled pork chops and collard green soup. Not bad. My Dad claims, after the fact, that he purposely was over-descriptive of the food offerings as a little jab at my Aunt, and maybe in this case he was, but my Dad has absolutely spent some time talking about little places they’ve stopped to eat or places they eat at regularly. So, whether in jest or not, it’s something he does. At any rate, that email is my Dad and it’s a great part of him and come hell or high water, someday, I’m eating at The Swanson.